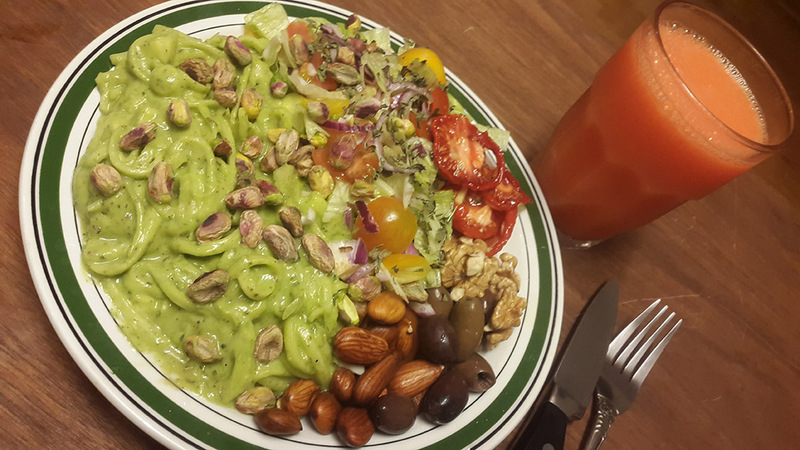 How about a creamy pasta with a filled with herbal & culinary tastes, coming with crunchy surprises, a delicious salad, olives & home-made dehydrated tomatoes (tastes just like the sun dried ones) and a glass of fresh juice ? This dish is not only super tasty but also vibrant, healthy, filling, live, complete protein & filled with most, if not all the nutritions you need. Tools needed: Spiral Slicer and a blender. Any type of a blender, wether upright/stationary or hand-mix blender will do it. A simple manual spiralizer is easy to get a hold of for a fairly good price. Here is one that you can order online. For the best taste & vibrational experience it is highly recommended to use only organic, raw & fresh ingredients. Walnuts – If not soaked in water for a few days you should avoid this. 1. Wash 1 organic zucchini/squash. 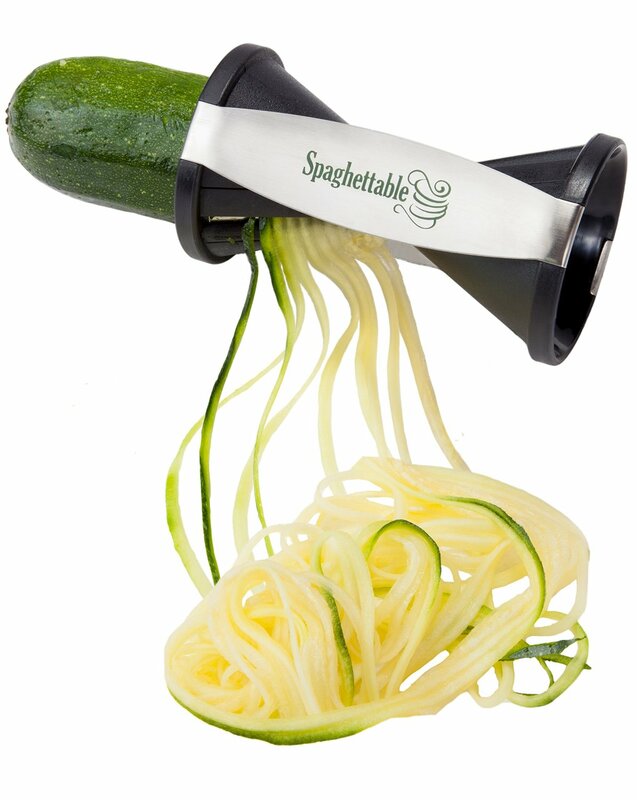 Rotate the zucchini through the Spiral slicer just like a pencil through a pen sharpener. (like in the photo above). Voila : you pasta is ready, but it in a bowl and prepare the creamy sauce. 2. Blend all the ingredients listed for the Sauce in a blender until you get a creamy thick sauce. 3. Mix the creamy sauce with the pasta that you made earlier. 4. Prepare you salad by chopping all the ingredients in the salad list above. 5. Serve the pasta and the salad on a plate. 7. Enjoy a vibrant meal. For an even more culinary taste experience, you can make your own dehydrated tomatoes and serve it along with the dish. Chop 5 big tomatoes in thin (0,5 cm ) slices, put them in a dehydrator for about 9-12 hours on 41 degrees celsius. Mix the tomatoes, garlic and ginger in a jar, pour organic olive oil over it. let it stand in room temperature for 4 days. Then keep it in the fridge. – Complete protein with all 20 amino acids in big amounts. – Healthy and unprocessed plant-based carbohydrates.